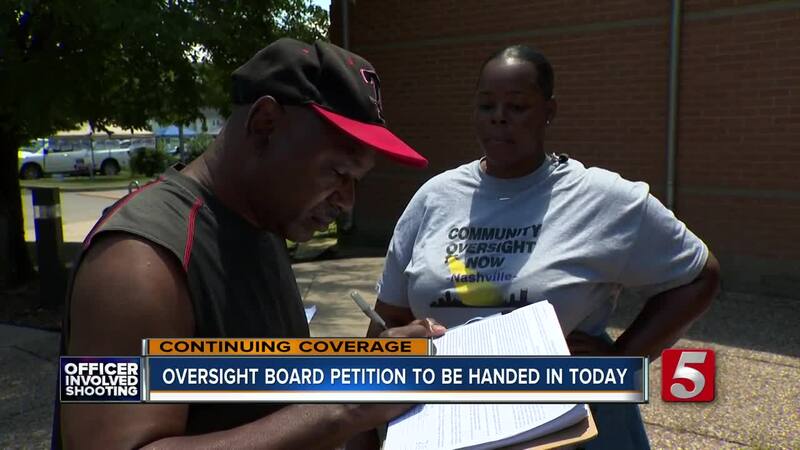 The group Community Oversight Now filed a petition, bringing them one step closer to putting a new amendment on the November ballot to create a community oversight board after last week's fatal officer-involved shooting. 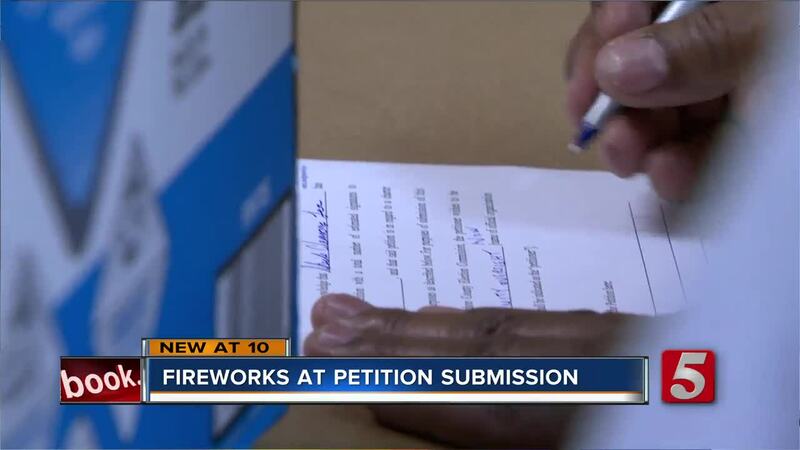 According to group officials, they collected more than 7,900 petition signatures in support of creating the board. They needed signatures of 10 percent of the voters in the August 4, 2016 local general election which is 3,900 – doubling the number of signatures needed. 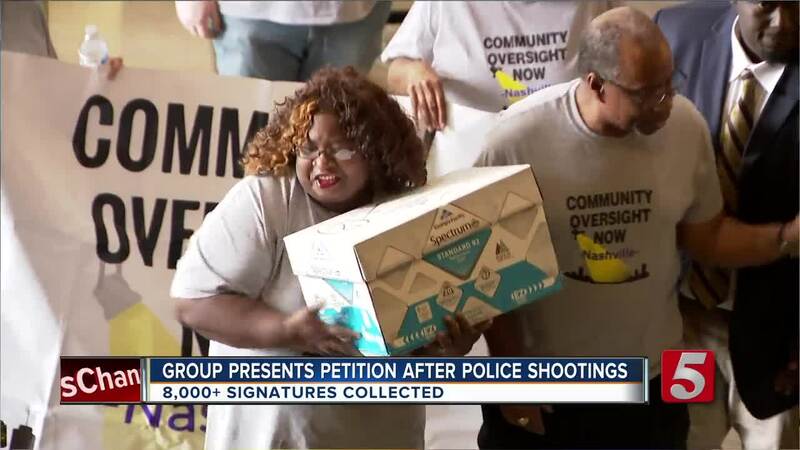 The activist group submitted their petitions to the Metropolitan Clerk at 2 p.m. Wednesday. However, shortly after their excited presentation of the petition things took a different turn. The court clerk, who we're told knew this group was coming and when, was no where to be found. Time passed and tempers began to flare. “I don’t want to hear no more sorrys. I’ve been hearing sorry since February, 10 2017, I’m tired of sorrys,” Sheila Clemmons said, raising her voice. Clemmons' son, Jocques Clemmons, was shot and killed last year by a Metro Nashville Police officer. After about 45 minutes of back and forth the Deputy Court Clerk signed and accepted the petition. The groups attorneys who were present, were confident it is valid despite the court clerk not signing it. 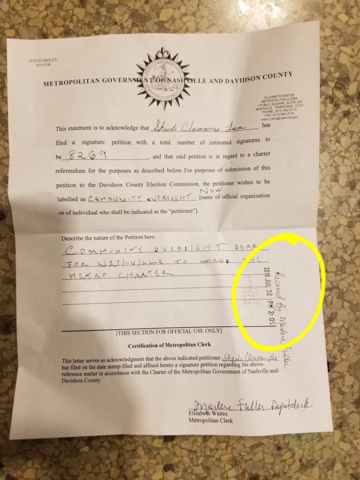 However, after the cameras and crowds left, folks with Oversight Now noticed the petition had been stamped with a date of July 32, 2018, a date that does not exist. They said the issue was fixed. "Had we left the office without pressing Metro to follow protocol, our petitions would have easily been challenged or invalidated. The people of Nashville are asking for transparency and accountability and they deserve nothing less. This is just the latest example of the obstruction that we've encountered every step of the way. And for clarification, until Jon Cooper arrived, everyone refused to sign, not just Elizabeth Waites, with whom we'd confirmed our appointment time." As long as enough of the signatures are verified, the charter amendment will be on the November 6th ballot. If an amendment makes it on the ballot and passes, the independent board would have investigative and compulsory powers to address police accountability. Community Oversight Now formed back in February 2017 after Clemmons' son was killed. His death and the controversy surrounding the investigation sparked outrage throughout the community. Last week's fatal shooting of Daniel Hambrick has only intensified their efforts. “I wanted to hand it over because ever since February 10, 2017 we have been talking about a community oversight board,” Clemmons explained. Another issue at the forefront of the coalition, is body cameras and the lack of video in some of these incidents, including Hambrick's fatal shooting. It's a sentiment echoed by neighbors also calling for immediate action in the way officers police Nashville. The city did approve $15 million for its police body camera program a year ago – that’s still moving forward, but Metro Police said the budget does not include funds for staffing the program. The Davidson County Election Commission will need to verify the submitted signatures after the petitions are submitted before the amendment makes it on the ballot.